Brief Description: Three thousand years ago one of the earliest scriptures ever recorded, the Book of Enoch, Noah’s great-grandfather, was written; 365 of the scriptures contained therein had been discovered, but one was missing. This lost parchment was purported to provide startling details of encounters with benevolent alien beings called The Watchers – information that could challenge and change traditional perceptions of mankind and the world. 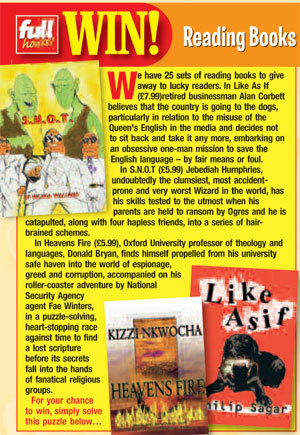 Oxford University professor of theology and languages, Donald Bryan, finds himself propelled from his university safe haven into the world of espionage, greed and corruption, accompanied on his roller-coaster adventure by National Security Agency agent Fae Winters, in a puzzle-solving, heart-stopping race against time to find the lost scripture before its secrets fall into the hands of fanatical religious groups. Everything you think you know about the world and its history, including the true identity of Christ and the secret inner workings of the US Government and influential worldwide corporations, will be thrust into doubt. Heavens Fire raises a crucial question: is there any truth? And the shocking answer is: those who know don’t care; and those who care don’t know. 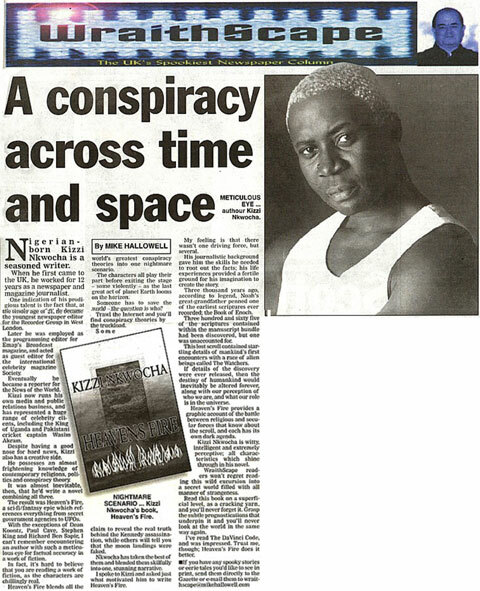 About the Author: Nigerian-born married father Kizzi Nkwocha made his mark in the UK initially working for 12 years as a newspaper and magazine journalist, and at the age of 21 became the youngest newspaper editor for the Recorder Group. He subsequently worked as the programming editor for Emap’s Broadcast magazine, acted as guest editor for the international celebrity magazine, Society, and finished his journalistic career as a News of the World reporter. Now a widely respected and successful media consultant and public relations specialist, who has represented a diverse range of clients, including the King of Uganda, the mistresses of President Clinton, Pakistani cricket captain Wasim Akram, campaign group Jubilee 2000, and the Vass Foundation, an international charitable organisation that focuses on alleviating the problems of AIDS and malaria in the Third World, he was voted one of the hundred most influential black people in the UK. Nkwocha has also become a well-known face in both radio and television, having been the focus of a Channel 4 documentary on publicity and having hosted his own talk show, London Line, on Sky, interviewing such names as Lennox Lewis and Muhammad Ali. He has also co-presented a weekly current affairs programme in Spain on Radio Onda Cero International. the point. Still, there is significant detail of information we would all raise an eyebrow within the short chapters that whisk you backward and forward within the plot, which results in a sprint of a read and not a marathon lesson in religion and politics about who is who. And, what is what to believe. But, do we care if Christ was made up of many parts from his past or that aliens were the first messiahs? I doubt it. Especially, in this modern selfish world that uses religion and it’s Gods as an excuse for human weakness. We need a book such as, ‘Heavens Fire’, to give us a shock upon the reality we choose to believe. You won’t know until you read it. Then, ask yourself: Do you care? This was indeed a gripping thriller right to the end - I really enjoyed it! I was enthralled by this thriller from the start. I was gripped by the intrigue, the chase for answers and the characters embroiled in it. At times I found it hard to put down. It was exciting, believable and pacey. My only criticism is that I wanted more! A talented writer with a big future! A rollercoaster thriller peppered with little known facts and theology, the latter starting lively debate with several acquaintances about religion and many other things. From England it starts off gently enough with a lecture at a university, and then ‘Indiana Jones’ style we’re whisked off around the world in a race against time to find Enoch’s missing scroll. Religious cults and a powerful secret underground society vie with an Oxford university professor and a female NSA agent to find the lost scripture. Parallels could be made with the Da Vinci Code, but this is snappier and more to the point rarely allowing the book to be put down. And it’s worth reading just for the real life, controvercial revelations that pop up throughout. A super debut novel that will stay with me for a long time, for many reasons. When one first begins reading this book, you can't help but see the comparisons to The DeVinci Code; the actual true organizations, the hidden history, the man who dies with an encrypted message scrawled near him, and the expert in languages and theology. And the "challenge" as the author puts it, that things in our world are not quite what they seem. That being said, it is an interesting storyline, and once you have been gripped by the mysterious turns and quirks in the book, you don't want to put it down. It was entertaining, and if you want to accept the challenge, it is there for you. I, quite honestly like my faith just the way it is and am very defensive about my Jesus I have always believed that God is God, whatever name you call him, Budda, Allah, or Jehovah. But it is not a book solely about religious comparisons, and, the revealed truths about other organizations certainly rankled and gave more than food for thought. The book left you wanting more...more from the author so that you didn't have to puzzle it out for yourself. It is quite intriguing, and yes, it is challenging in more than one area. If you like murder, mystery and like to actually think, then this book is for you.It changed the way I felt about certain large organizations, and made me want to get others involved. I thoroughly enjoyed it! A tactically brilliant and gripping tale narrated by a master story teller. The military scenes are written with an uncanny eye for detail and delivered with the unerring precision of a sniper rifle. First class. This is an intriguing read from the start. Taking the reader on a roller coaster ride that they will not want to get off. 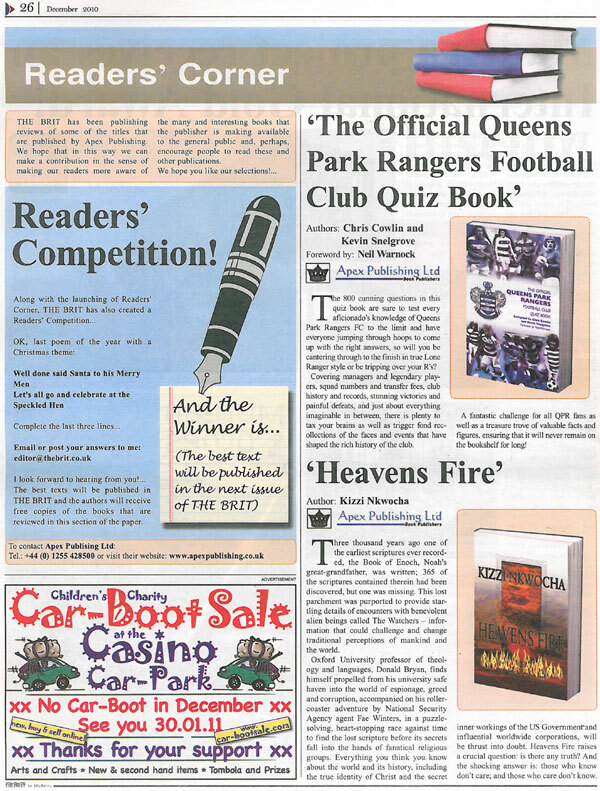 Fact and fiction skilfully combined to great page turning effect. I finished this book and wanted to know more. Is there a sequel in the making? 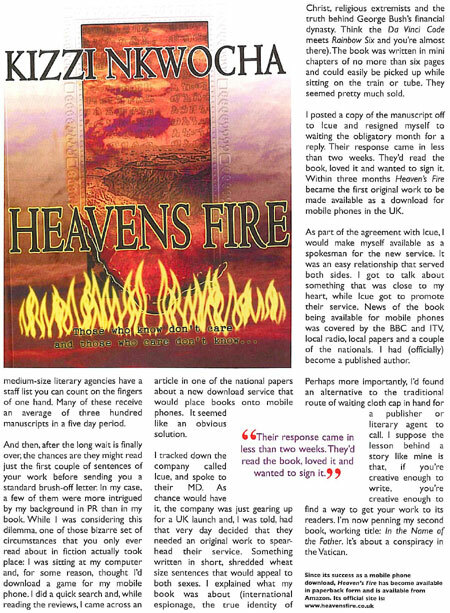 Clever, thought provoking and extremely well researched, Heaven's Fire has more twists than a Chubby Checker L.P.
An MI5 investigation into a Freemason-like sect runs parallel to an Indiana Jones-type search for a lost scripture deep in the Holy Land to keep the reader on their toes like a six-year old at a sweet shop counter. 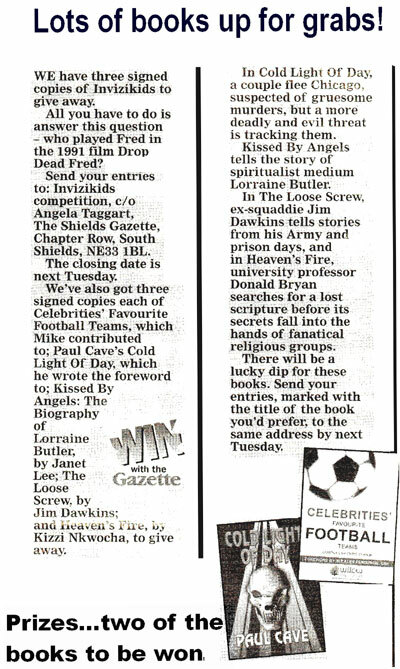 If you are a fan of the Da Vinci Code - and who isn't? - then you will love this gripping thriller. Fact or fiction? Make your own mind up but one thing is for sure, more shadows have been cast over the very roots of that thing we have come to know as religion. Thumbs up! Nigerian-born Kizzi Nkwocha is a seasoned writer. When he first came to the UK he worked for 12 years as a newspaper and magazine journalist. One indication of his prodigious talent is the fact that, at the tender age of 21, he became the youngest newspaper editor for the Recorder Group. Later he was employed as the programming editor for Emap’s Broadcast magazine and acted as guest editor for the international celebrity magazine Society. Eventually he became a reporter for the News of the World. Kizzi now runs his own media and public relations business and has represented a huge range of celebrity clients, including the King of Uganda, the mistresses of President Clinton and Pakistani cricket captain Wasim Akram. Despite having a good nose for hard news, Kizzi also has a creative side. He possesses an almost frightening knowledge of contemporary religions, politics and conspiracy theory. It was almost inevitable, then, that he’d write a novel combining all three. The result was Heaven’s Fire, a sci-fi/fantasy epic which references everything from secret government agencies to UFOs. With the exceptions of Dean Koontz, Paul Cave, Stephen King and Richard ben Sapir I can’t remember encountering an author with such a meticulous eye for factual accuracy in a work of fiction. In fact, it’s hard to believe that you are reading a work of fiction, as the characters are chillingly real. Heaven’s Fire blends all the world’s greatest conspiracy theories into one, nightmare scenario. The characters all play their part before exiting the stage – some violently – as the Last Great Act of planet earth looms on the horizon. Someone has to save the world – the question is who. Trawl the Internet and you’ll find conspiracy theories by the truckload. Some claim to reveal the real truth behind the Kennedy assassination, others will tell you that the moon landings were faked. 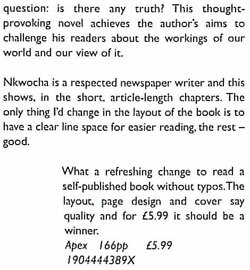 Nkwocha has taken the best of them and blended them skilfully into one, stunning narrative. 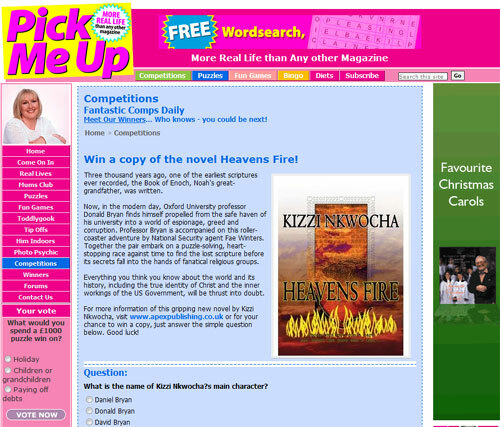 I spoke to Kizzi and asked just what motivated him to write Heaven’s Fire. My feeling is that there wasn’t one driving force, but several. His journalistic background gave him the skills he needed to root out the facts; his life experiences provided a fertile ground for his imagination to create the story. Three thousand years ago, according to legend, Noah’s great-grandfather penned one of the earliest scriptures ever recorded; the Book of Enoch. 365 of the scriptures contained within the manuscript bundle had been discovered, but one was unaccounted for. This lost scroll contained startling details of mankind’s first encounters with a race of alien beings called The Watchers. If details of the discovery were ever released, then the destiny of humankind would inevitably be altered forever, along with our perception of who we are and what our role is in the universe. Heaven’s Fire provides a graphic account of the battle between religious and secular forces that know about the scroll, and each has its own dark agenda. 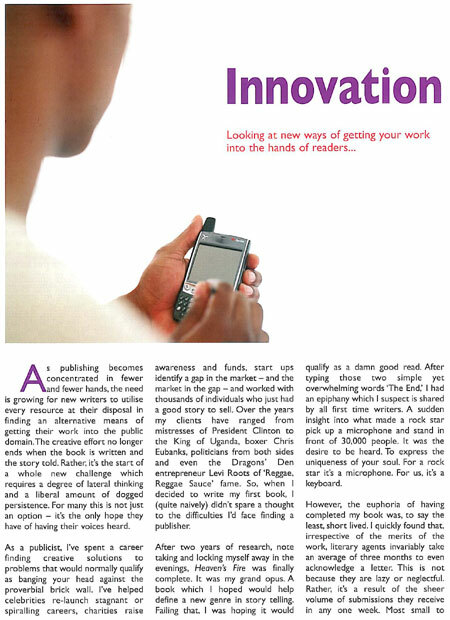 Kizzi Nkwocha is witty, intelligent and extremely perceptive; all characteristics which shine through in his novel. WraithScape readers won’t regret reading this wild excursion into a secret world filled with all manner of strangeness. Read this book on a superficial level, as a cracking yarn, and you’ll never forget it. Grasp the subtle prognostications that underpin it and you’ll never look at the world in the same way again. I’ve read The DaVinci Code, and was impressed. Trust me, though; Heaven’s Fire does it better. If you are closed minded to uncomfortable theories or facts then avoid this book altogether. If, however you have a questioning mind then Heavens Fire is one that may blow it into the next century. With reference to mankind, religion and ancient scriptures this is a cross between The Bourne Supremacy, The Holy Grail and The Da Vinci Code. But better. This thought provoking novel has everything: intrigue, conspiracy theories, and life or death situations on an international level, written in a fresh style that gets even the hardest critic sucked in. As the story unfolds your need-to-know guarantees this book to be a page-turner. Every thing you have ever believed will be turned on its head. A fascinating read. Be educated. Pots will burn on the stove - dinner will be ruined. Take a bizarre religious cult, a smattering of secret government agencies, a coded ancient manuscript and a brace of UFOs and you’ll be half way to collecting the ingredients for this terrific story. With the exceptions of Dean Koontz, Paul Cave, Stephen King and Richard ben Sapir I can’t remember encountering an author with such a meticulous eye for factual accuracy in a work of fiction. Heavens Fire is chilling because it is really fact dressed as fiction. Nkwocha’s tale is not a story of something that may just be possible; it is a frightening account of what may already have taken place to a substantial degree. Heavens Fire blends all the world’s greatest conspiracy theories into one, nightmare scenario. The characters all play their part before exiting the stage – some violently – as the Last Great Act of planet earth looms on the horizon. 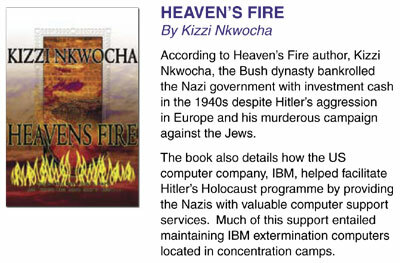 Kizzi Nkwocha was interviewed on BBC Northampton 104.2FM, answering questions and talking about his book 'Heavens Fire'. 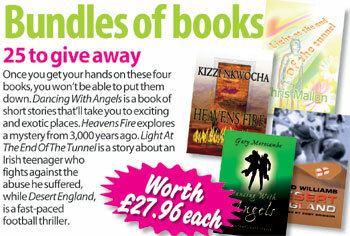 Kizzi Nkwocha was interviewed on BBC Asian Network, answering questions and talking about his book 'Heavens Fire'. Kizzi was interviewed on the Nikki Bedi show. 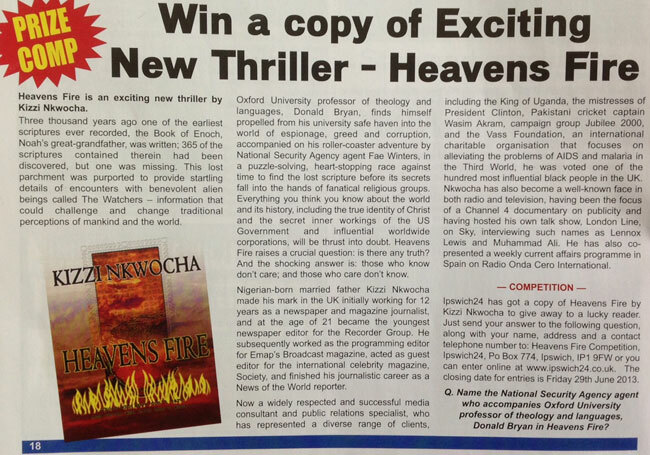 Kizzi Nkwocha was interviewed on his local radio station, Sovereign Radio 107.5FM, answering questions and talking about his book 'Heavens Fire'. 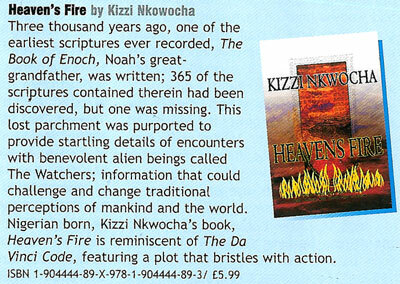 Radio 123 (Netherlands) reviewed 'Heavens Fire' written by Kizzi Nkwocha. 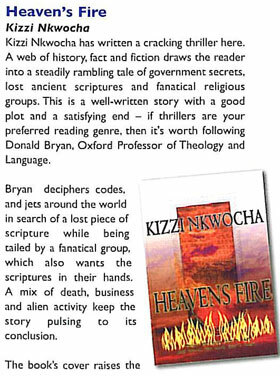 Kizzi Nkwocha was interviewed by Philip Solomon on Wolverhampton City Radio 101.8FM, answering questions and talking about his book 'Heavens Fire'. 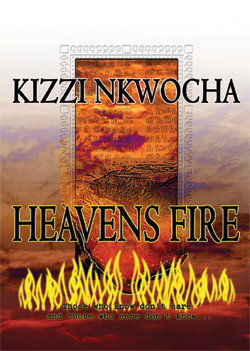 I've never written a review before but have just finished reading Kizzi Nkwocha's Heavens Fire and have to say its probably one of the best fiction novels I've read in the past ten years. Amazing. The book uses a lot of historical data and introduces ideas that had me doing my own research just to make sure that what it was saying was true. Has anyone heard any competing ideas about Jesus's real identity? Also, there's a lot in the book about Bush's dynasty and how the family made its money during the Nazi period in Germany. Is this common knowledge? I'd really recommend this book to anyone who's interested in historical fiction with a strong contemporary relevance. I've heard that there's a possible movie being based on Heavens Fire. Really looking forward to seeing how it translates on the big screen. I really enjoyed reading this book. I sat and read it in one go as I wanted know what would happen next, and I was not disappointed. Question is – is there a sequel? If so I want it! This is far superior to the Da Vinci Code, not as pedantic, much faster moving, easier to read and with characters that you empathise with. A very good read.